A stirring chronicle of Ireland’s history! Using film taken of the momentous events surrounding Easter Week 1916, Mise Éire has footage of Dublin during the Rising and of the main protagonists. Chronicle of the period 1896-1918 using contemporary film and photographs. A major restoration programme for the centenary year has resulted in a newly digitised film in both DVD and Blu-ray formats. 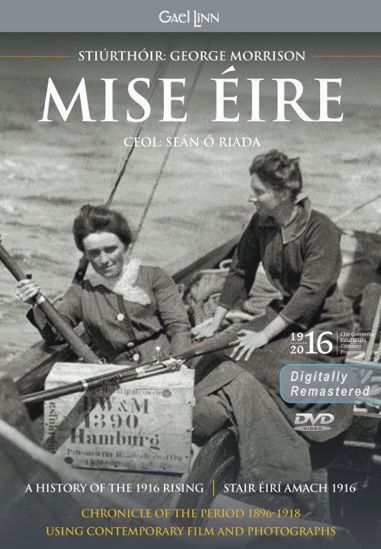 Mise Éire is unrivalled as a presentation of living history and the film is accompanied here by an explanatory booklet, together with extensive additional film material. Trí úsáid a bhaint as nuachtscannáin agus grianghraif na linne, ríomhann Mise Éire stair na tréimhse 1896-1918. George Morrison a bhí ina stiúrthóir, Seán Ó Riada a chum an ceol nuálach agus Gael Linn a d’eisigh. Feictear i Mise Éire, cur síos ar na mór-imeachtaí i ndáil le hÉirí Amach 1916, ar an méid a tharla lena linn agus faightear radharc ar na mórphearsana a ghlac páirt, ina measc, Ó Cléirigh, Ó Coileáin, de Valera agus Carson. Beoléiriú staire gan sárú atá i Mise Éire agus tá leabhrán mínithe leis anseo, mar aon le hábhar scannánaíochta sa bhreis. Eagrán athchóirithe ó bhunábhar an scannáin, togra a cuireadh i gcrích i gcomhar leis an IFI agus le cúnamh Chlár Comórtha 1916 an Rialtais.